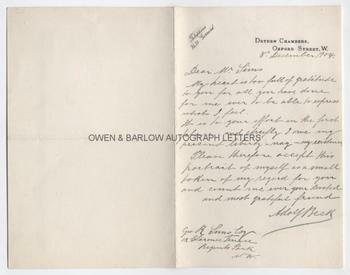 ADOLF BECK Autograph Letter Signed. Norwegian born British victim of miscarriage of justice. His case led to the creation of the English Court of Criminal Appeal. 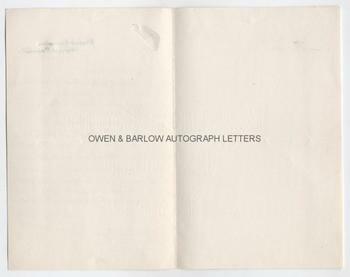 An autograph letter of thanks to the Daily Mail journalist, G.R. Sims. The man who was instrumental in getting Beck's case reviewed. This, ultimately, resulted in securing his release and the quashing of his conviction. The autograph of Adolf Beck is scarce. ALS. 1p plus integral blank leaf. Dryden Chambers, Oxford Street, W. 8th December 1904. To Geo[rge] R[obert] Sims. "My heart is too full of gratitude to you for all you have done for me even to be able to express what I feel. It is to your effort in the first place, and chiefly I owe my present liberty, nay, my existence. Please therefore accept this portrait of myself as a small token of your regard for you and count me ever your devoted and most humble friend." 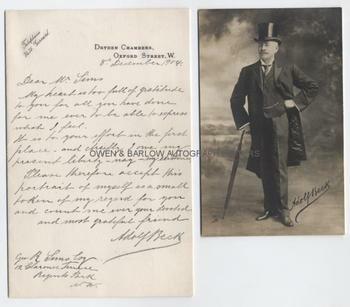 The letter enclosed a photographic portrait post-card of Adolf Beck, signed in facsimile, which is still present and included with this item. 8vo. Approx 7 x 4.5 inches. In very fine condition. The post-card photograph shows Adolf Beck, full-length, in frock coat and silk top-hat, hand on hip and leaning on a furled umbrella. It has Beck's signature in facsimile. It is in very fine condition. Adolf Beck became the centre of one of the most famous causes celebre of the 19th century when he was wrongfully convicted of swindling women and sentenced to seven years penal servitude in Portland Prison. Adolf Beck had made a fortune as a financier and speculator but, following the disastrous purchase of a mine in Norway, was made virtually destitute. He nevertheless kept up appearances and dressing in a thread-bare frock coat and silk hat. One day he was accosted at his front door by a woman who claimed that he had, calling himself 'Lord Willoughby', swindled her out of watches and jewellery. A policeman was called and Adolf Beck was arrested and charged with fraud. Beck had an alibi and the defence was one of mistaken identity but, despite this, he was convicted with the crime and four other counts based on similar past incidents. The real fraudster was a man called John Smith and Beck did bear a striking similarity to him. During his time in prison, his lawyers made ten unsuccessful applications for the case to be reviewed. At that time, however, there was no court of criminal appeal in England and despite the fact that new evidence had emerged concerning the identity of John Smith, Adolf Beck remained in prison for 5 years but, on his release, he was again arrested and convicted on a 2nd charge involving a similar fraud. His case was taken up by Daily Mail journalist, G.R. Sims. Sims, in the newspaper, published the facts of the case and the details that indicated that this was a blatant case of mistaken identity. He orchestrated a public campaign and the clamour eventually forced the court to review its decision. Beck was freed and given a Royal Pardon. Thanks to a further campaign by G.R. Sims, he was also awarded compensation of £5,000. So notorious was the case of Adolf Beck that it directly resulted in the creation of the English Court of Criminal Appeal. Adolf Beck never recovered from the experience and died a broken man in 1909. George Robert Sims (1847-1942) was a journalist, poet and novelist. He was a friend of Arthur Conan Doyle and one of the most avidly read and best loved journalists of his generation. He wrote extensively on the Jack the Ripper murders (becoming one of the foremost experts on these) and, at one point, was even a suspect himself. He was a campaigner for better conditions for the poor and other social causes. He wrote several ingenious detective stories but is perhaps best known today as the author of the monologue that opens "it was Christmas Day in the workhouse". He amassed a large fortune but led a bohemian lifestyle and by the time of his death and gambled most of his money away.